The actor's middle name by birth is d'Arcy. As there was another actor named Brian James in Equity, he uses his full name as his professional name. He graduated from Northwestern University's School of Communication. He received a nomination for the Tony Award for Best Featured Actor in a Musical in 2002 for his portrayal of Sidney Falco in Sweet Smell of Success, co-starring John Lithgow. He received an Obie Award for his performance in the one-man play The Good Thief by Conor McPherson. Additional Broadway credits include playing Frederick Barrett in Titanic, Lincoln Center's Carousel, and Blood Brothers. Off-Broadway credits include Andrew Lippa's The Wild Party in 2000 opposite Julia Murney and Idina Menzel for which he received a Drama Desk Award nomination, as well as Adam Guettel's Floyd Collins and the Gershwins' Pardon My English. He appeared in Martin McDonagh's The Lieutenant of Inishmore on Broadway, replaced Norbert Leo Butz in Dirty Rotten Scoundrels, and starred in The Apple Tree opposite Kristin Chenoweth. In 2004, he released a Christmas album titled From Christmas Eve to Christmas Morn. He was the Broadway version of Bob Wallace, whose character was originated by Bing Crosby, in White Christmas in 2004. He played the role of Dan Goodman in the new musical Next to Normal Off-Broadway at Second Stage Theatre in 2008. He then starred opposite Sutton Foster and Christopher Sieber as the title character in Shrek the Musical. The show began previews on Broadway November 8, 2008 and opened on December 14 at The Broadway Theatre after a tryout in Seattle. For this role he won the Outer Critics Circle Award for Outstanding Actor in a Musical and the Drama Desk Award for Outstanding Actor in a Musical. He was also nominated for the Tony Award for Best Leading Actor in a Musical for his portrayal. He departed the cast after one year in the role and was replaced by Ben Crawford. James starred in the Broadway play, Time Stands Still which began preview performances on January 5, 2010 and officially opened on January 25 at the Samuel J. Friedman Theatre. The show ended its limited run on March 27, 2010. For this role he won the broadway.com Audience Award for Favorite Featured Actor in a Play. He reprised the role of Dan Goodman in the Broadway company of Next to Normal at the Booth Theatre. He replaced J. Robert Spencer beginning May 17, 2010. James ended his limited engagement on July 18, 2010 and was replaced by Jason Danieley. On July 19, 2010 James performed in front of President Barack Obama and First Lady Michelle Obama at A Broadway Celebration: In Performance at the White House, which also aired on PBS October 20, 2010. He returned to Time Stands Still when the show returned to Broadway. It closed on January 30, 2011. James was part of the cast of the NBC musical series Smash, playing Frank, who was the husband of Debra Messing's character. NBC officially picked up Smash as a series on May 11, 2011. The program made its series premiere on February 6, 2012. He did not return to the show as a series regular for its second and final season. James starred in Torstein Blixfjord's 2012 short film Bird In A Box. He co-hosted the 57th Drama Desk Awards with Brooke Shields on June 3, 2012. James starred as Bick in the new musical, Giant, which ran at the Public Theater from October 26 - December 16, 2012. For this role James received a nomination for Best Actor in a Musical at the Drama Desk Awards and Drama League Award for Distinguished Performance. He also performed at the 29th birthday celebration of the New York Pops, which was a celebration called "Journey On", celebrating the work of Stephen Flaherty and Lynn Ahrens. He performed "Wheels of a Dream" from Ragtime with Andrew Rannells, Rebecca Luker, Liz Callaway, Kevin Chamberlin, Jason Danieley, Boyd Gaines, Lewis Grosso, Norm Lewis, Kecia Lewis-Evans, Darlene Love, Marin Mazzie, Tiler Peck, Nikki M. James, Rachel York, and LaChanze, along with Flaherty and Ahrens. He played Banquo in the Lincoln Center Theater production of Macbeth, which began previews in October 2013 and officially opened at the Vivian Beaumont Theatre in November 2013. He starred as the original King George III in the off-Broadway production of the acclaimed musical Hamilton, with previews starting January 20, 2015 and officially opening on February 17. Actor Jonathan Groff replaced James in the off-Broadway run on March 3, 2015. He stars in a new musical on Broadway, Something Rotten!, which opened in previews at the St. James Theatre on March 23, 2015 and officially on April 22, for which he received his third Tony nomination. James played Matt Carroll in the 2015 film Spotlight. In March 2016, it was announced that James was cast in the CBS pilot, Superior Donuts. James was born in Saginaw, Michigan, the son of Mary (née Kelly), a seller of children's books, and Thomas F. James (deceased), a lawyer. His maternal grandfather was Harry Kelly, a former Governor of Michigan. His uncle, Brian Kelly, was an actor featured in the series Flipper and a producer of the movie Blade Runner. He has three siblings: brother Andrew, a portfolio manager; sister Kate, an actress and writer; and sister Anne (Noonan), an actress and teacher. Brian is married to Jennifer Prescott, whom he met when both performed in a Lincoln Centre production, and together they have a daughter, Grace. The Apple Tree Adam/Sanjar/Flip Encores! 2011 Person of Interest Wheeler 1 episode: "Pilot"
↑ "Crawford Will Be Shrek This Fall on Broadway; Tix on Sale Through May 2010" Archived August 17, 2009, at the Wayback Machine., playbill.com; accessed September 26, 2016. 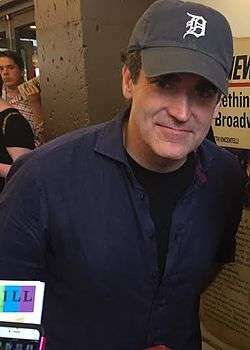 ↑ It's Time for Brian d'Arcy James to Thank Fans for His 2010 Audience Award, broadway.com; accessed September 26, 2016. ↑ Brian d'Arcy James Joins Cast of "Smash" Musical Pilot Archived March 12, 2011, at the Wayback Machine. ↑ Hetrick, Adam. "'Spring Awakening' Star Is New King of Broadway-Bound 'Hamilton'", Playbill.com, February 25, 2015. ↑ Robinson, Will. "Spotlight star Brian d'Arcy James cast in CBS' Superior Donuts", ew.com, March 1, 2016. ↑ "Today I'm thinking of my grandfather Harry F. Kelly". Twitter. November 11, 2014. Retrieved November 18, 2014. 1 2 Harris, Richard (Fall 2015). "The Life of Brian". Northwestern Magazine. Northwestern University. Retrieved 2016-09-26.